The Bankruptcy Section was founded to promote high standards in the practice of bankruptcy and insolvency law. Its members are amongst the highest regarded bankruptcy attorneys in the United States. They have been involved in virtually every type of bankruptcy and reorganization matter. Their expertise extends to the avoidance of bankruptcy as well through out of court workouts, state court receiverships and identifying other means to help the troubled business. The the Section alerts is members of late breaking cases and items of importance to their practice through the Bankruptcy Section Practice Alert. The Section co-sponsors the highly acclaimed “Current Developments in Hot and Emerging Areas in Bankruptcy” annually at the National Conference of Bankruptcy Judges. Drawing over 1,000 attorneys and other bankruptcy practitioners, this program is one of the highest regarded educational offerings available each year. The Section is extremely active in sponsoring programs during all CLLA meetings for its members on high level bankruptcy related topics. The Bankruptcy Section is the bankruptcy resource arm for the League and has provided the written position papers and testimony on the dozens of times the League has been invited to testify before Congressional committees on bankruptcy issues. The League and Section’s position papers have not only been submitted to Congress, but have been recognized as one of the sole organizations committed to non-partisan commentary on the proposed changes to the Bankruptcy Code. The Bankruptcy Section is also the sponsor of the Annual Lawrence P. King Award for Excellence in the Field of Bankruptcy. This award is presented to recognize that lawyer, judge, teacher or legislator who exemplifies the best in scholarship, advocacy, judicial administration or legislative activities in the field of bankruptcy as epitomized by Professor King. Click here to view the Venue Reform page. 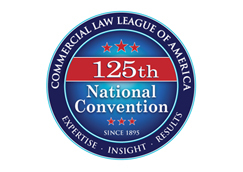 Since 1895, the not-for-profit Commercial Law League of America has connected experienced attorneys with credit grantors, lending institutions and other commercial credit, bankruptcy and general finance industry members through networking, education, legislative advocacy and specialized legal services.